Mad About Meghan: Meghan in Summery Red Erdem for Candid Sighting! Meghan in Summery Red Erdem for Candid Sighting! New candid photographs of Meghan Markle have emerged! The images show Meghan arriving at her Toronto home on Sunday, 24 September, the day after the Invictus Games Opening Ceremony. There are several images available on the Mail Online. 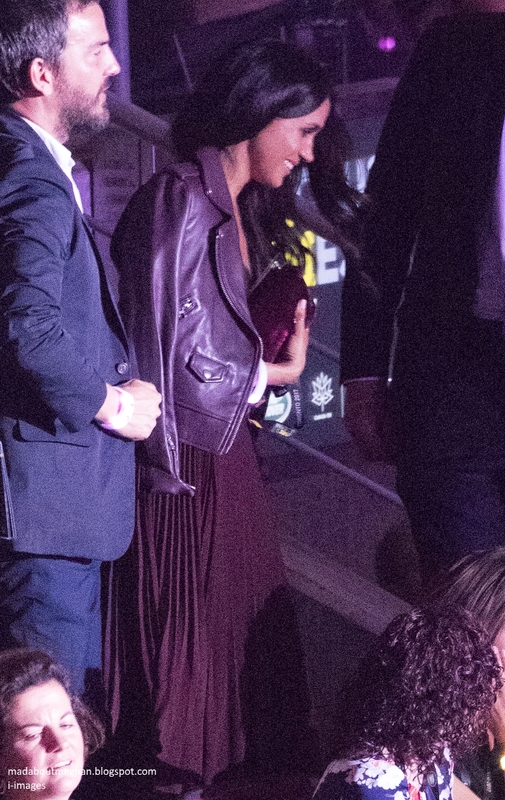 Below we see Meghan looking stylish the night before in the burgundy Mackage Baya Leather Jacket and a dress by Aritzia.. It's always fun to see the odd candid snap as it gives us an insight into Meghan's personal style. It came as no surprise to learn Meghan's feminine, pretty dress is by Canadian designer Erdem (another amazingly swift ID from the Meghan's Mirror team). Interestingly, Meghan recently spoke about her love of Erdem in the Vanity Fair interview. 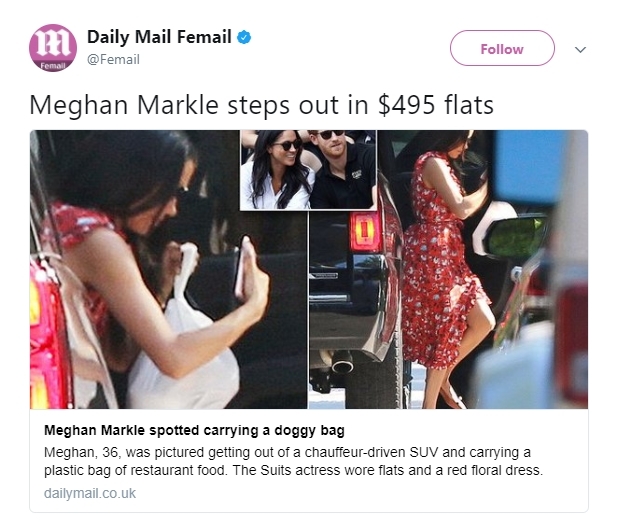 Writer Sam Kashner noted "Markle was wearing a red, knee-length floral dress (“Erdem, a designer I’ve been wearing for years”)". Could it be the same dress? Made in England, the Erdem Sebla Convertine Crepe De Chine Dress features button front closures, a belted waist and ruffled trim. 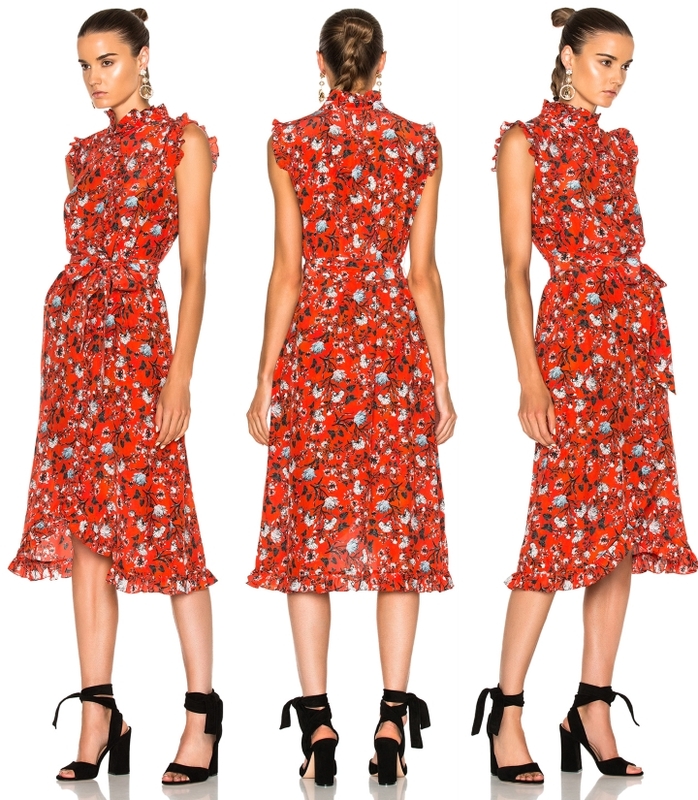 From the product description: "Bringing together an eye-catching print in red, white and black and on-trend ruffles, this silk dress from Erdem Moralioglu is the kind of modern feminine garment we'd wear with white plimsoles and sophisticated sandals alike." The print is gorgeous, isn't it? 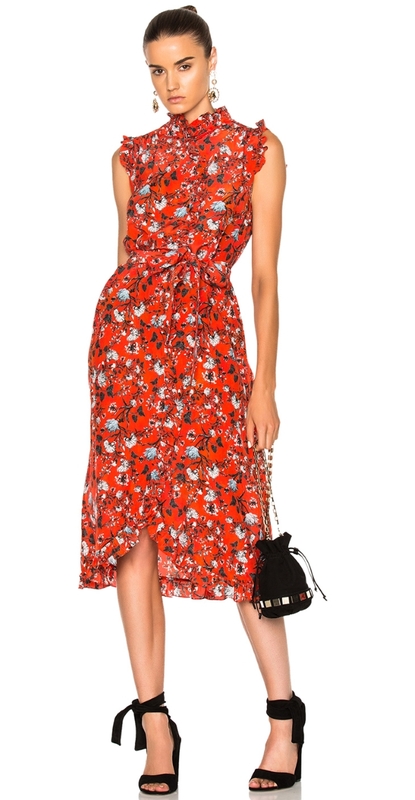 The Sebla dress is sold in the red print Meghan wore, but remains available in several sizes in black multi print at Saks Fifth Avenue. Meghan teamed the dress with her trusty Sarah Flint Natalie Flats in 'saddle'. We have one more fashion update to share and it concerns Meghan's stylish mother Doria. Lila F kindly messaged me to let know the chic top Doria wore to the Invictus Games Closing Cermeony is a Burberry piece - one of Meghan's favourite brands. 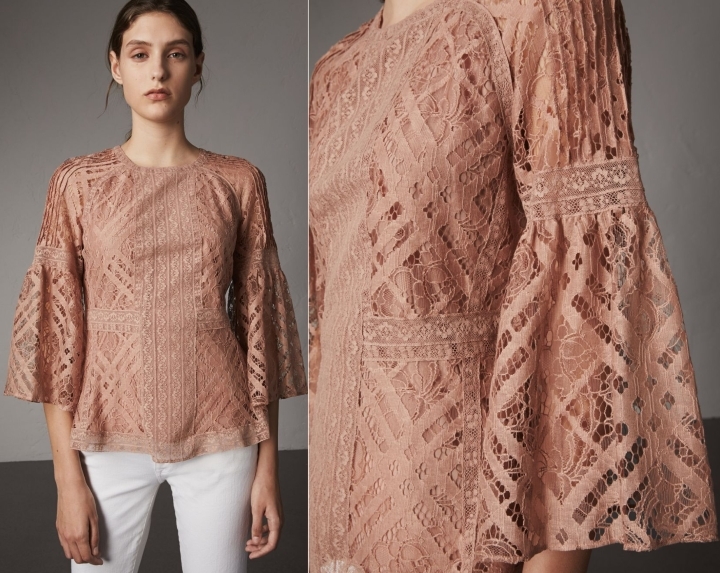 The Bell-Sleeve Floral and Check Lace Top in 'pale ash rose' is formed from Italian-woven check lace and fine floral ribbons crafted on traditional looms in England. It was the perfect choice for the event. I would think Burberry a potential contender to make Meghan's wedding dress when if a wedding takes place in 2018. The shoes are sold out so I couldn't get one for you. Lots of time if you sign up for updates they send you a welcome email with a promotion code for a discount! I must say I am really not a fan of the dress, although she wears it well. However, I absolutely covet her shoes!!! These shoes and her spring/summer trench from the closing ceremony were my favorite pieces she wore during IG. 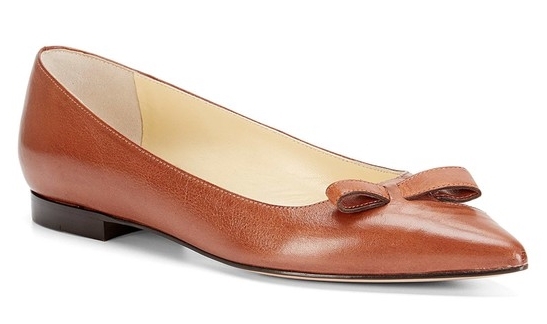 I love that she regularly wears flats also. I think Doria looked quite chic in her blouse, and I love that both she and Carol are so fashionable. I think what I'm not a big fan of is the ruffly things at the shoulder. I also do not understand the shoes with it in the look book photo (not Meghan's; those black ones). The ones with the other colored dress would look much nicer I think. The other print reminds me of a Christmas tree and I can't decide if that's a bad or a good thing. She wore similar ruffles and print in Jamaica. Here's hoping she will not create a habit of wearing different but very similar things and create sort of a "standard" look. Nothing really wrong with that but exciting fashion would be way better. For me it's not just the ruffles at the shoulders but also the neckline, hemline etc. I am a big lover of prints, but feel (with some exceptions of course) that they work best with clean, uncluttered lines. 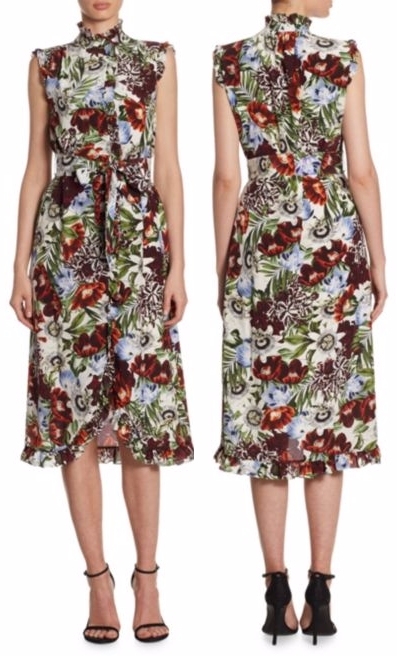 However as a fan of prints, even though I love flowers/florals it bothers me that in women's clothing the overwhelming majority of prints are floral. Are we not allowed to enjoy other motifs? I agree with you about the shoes Bluhare, they look like they're made from repurposed bin bags to me. Agree about the ruffles, Finn. I really don't like them at the shoulders, but I'm not really a fan of ruffles at all. I like prints, and I suppose there's always stripes or paisley. Or polka dots. But stripes can be problematic depending on your body type, and polka dots tend to be spring/summery. I do like paisley, and I also like plaid. Although sometimes plaid and houndstooth checks are better on separates. Dresses are difficult I think. 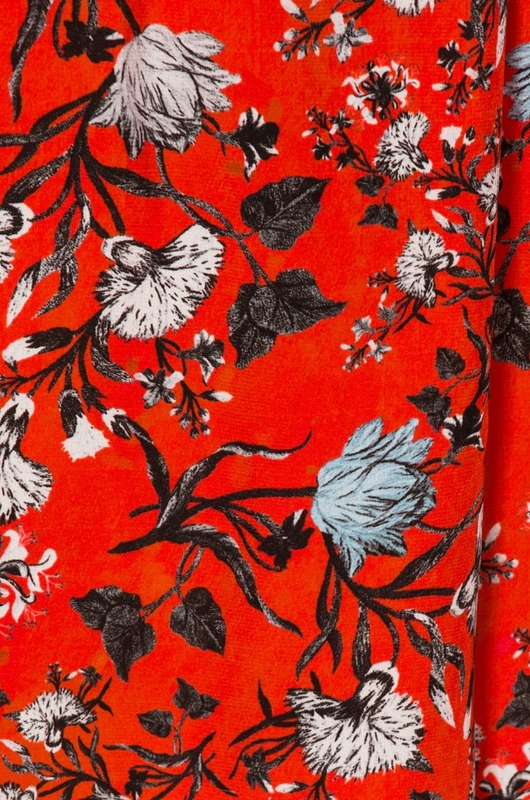 My favorite print is toile but that's really hard to do well in clothes. Toile works well in a pencil skirt, I think. I have one from Talbots that I wear all the time during the spring and summer. Have to say I admire it every time I put it on. Really, Erika? I would love a toile pencil skirt! Off to go look! We don't have a powder room (separate toilet and sink for people outside the US) in our house; if we did it would be a vision in toile!! I thought of another great example. Here's Gwendoline Christie looking chic in a flamingo print: http://dustyburrito.blogspot.com/2014/06/look-of-day-gwendoline-christie-aka.html?m=1. As far as toile is concerned, it's rare that I see someone successfully pul it off. What do you think of Dita von Teese's attempt? https://i.pinimg.com/236x/37/fe/6f/37fe6f3b1f66eabc404f4995cbe6680b--dita-von-daily-fashion.jpg I think she would have loved your Ascot look, Bluhare! My favorite is Dita von Teese. She knows how to rock her look, and she would look great in that Ascot look. I didn't even think of her when I was doing it, but she totally would. And Ruth Negga wears clothes so well. I'm not crazy about the dress, but the print totally brings out her eyes. Her Oscar outfit was fabulous. I loved it. Gotta admit I can live without the flamingos, but I love the color combination. Holy cow, I just went down a pinterest toile powder room wormhole. It was awesome. Bluhare, it took me a while and a good online dictionary to understand your last sentence 😜! I would be all over a toile powder room, bluhare. As it is, I have bits and pieces of toile throughout my house. Fortunately, my husband dislikes it, otherwise it would be everywhere and what a disaster that would be. As far as the skirt, I doubt you will find one. Mine is several seasons old. A seamstress might be the only way right now, although it is so hard to find decent fabric now. One of the best purchases I ever made. Lol SG, you probably do remember the skirt. I think it was on the cover of the catalogue with a two page spread when opened. It came in several colors. I have the red and white. Go check out the toile bathrooms, Erika. I was totally ready to gut ours when I saw some! Sorry, Zora! I forget some people don't have English as a first language and I can see why you were confused. And I'll keep my eye out for skirts! No problem, bluhare. One of the things I love about Charlotte's blogs is being in touch with English as people (and bluhares :) ) speak it. I realize my selections (barring Dita of course) are quite out there. I am just tired of clothes always looking the same/variations of each other I used to have much more conservative taste, I actually used to really like Kate's style pre-marriage, and the first year or two after. However, now I find that I really appreciate it much more when a designer takes a risk, and when women have the courage and confidence to attempt to pull off something truly unique. Someone truly stylish can make me like something I would normally hate, I love when that happens. I am hoping Meghan will be a nice mix of both, classic with a unique twist. I like some of the things she wears a lot, but dislike some of her selections also. I will be very glad if I continue to feel that way about her selections. I hope we will have a lot more to talk about than just her fashion going forward though! But I do think it can be used as a PR tool, and I think she knows that. I agree Finn. Have you seen Maxima of the Netherlands? This is a woman with big, bold taste and she wears it like she's on fire. I don't always like what she wears, but when she hits my taste frequency, I absolutely love how she looks. She knows how to dress like a Queen and does not shy away from the bling! Hope the link works. I don't like this dress or the stole. But my god, she wears it like it's the last gown on earth. I liked Kate's style too, and agree she's got much more conservative. The past few years I think some of her best looks were when she was pregnant, so maybe there will be some good ones coming up! Max was exactly the type of person I had in mind. I often dislike the individual pieces she's wearing but love the look. Even when I don't love it, I still enjoy seeing her selections. She's never not entertaining. I think MM will be a bit more classic than Max, but hopefully still fresh and modern. I think they both have the confidence to make most things they wear look great on them even if not to my taste on the hanger. Hahaha. Nice check on your last sentence! I think the first is correct, though. Lol I love your last comment Charlotte - it will be interesting if/when/who would get that wedding dress commission!! Burberry, Erdem or Roland Mouret all seem to be favourite designers of hers. I think it would be great to have a Style Meghan post for the engagement pics/moment ? Or is that jumping the gun too much?!! I might be jumping the gun on the 'When' LOL but as several of you mentioned it's looking quite likely now. And, Mr. D., what a WONDERFUL idea to start a Style Meghan post for the engagement already!! We have such talented stylists here - ahhh, the mere thought of an engagement announcement sets my brain in "super-activity-mode" (LOL). Like "What would someone like Meghan wear for the announcement? Her usual style (which I like btw; I think it suits her very much) - or something "very Royal"/more conservative-like"?" Oh, and please, let us also try and find a wonderful, real Princess-style engagement ring!! Just for fun! Oh dear, Mr. D., you really "jumped a gun" here!! I even already found a TIARA - at Tiffany´s ! It´s called "Fancy intense yellow diamond tiara" and the yellow stones would suit Meghans hair, eyes and skin tone beautifully!! Lol I think I only said out aloud what the rest of you were thinking?! I just googled that Tiara, Eve!. Excellent choice. You’ve given this a lot of thought already!!! (I wrote this about a couple of hours ago and it didn't show up.) Sorry for duplicate if it does show up. Eve. Are there buildings available in your area that are actually "smoke free" or is that just going to be by chance for you? Surfer girl: there is ONE building complex in Germany so far - which was built in 2014 (if I remember correctly). All flats were sold in days (well, I´m not surprised about that). More and more landlords are choosing non-smokers, but it´s still seen as a "personal right" to smoke here in Germany (although courts seem to be more favorable to the rights of non-smokers in recent times). Eve, I just googled that tiara. QUITE beautiful. I absolutely love it. I'm still wishing you luck, Eve. But what happens if you find a nice building and then a smoker moves in next door? I live in very non-smoker friendly territory. More and more buildings -- including apartments -- are non-smoking. I would *hate* to live right next door to someone smoking it up 24/7. Can't people vape? At least you can't smell that although the fumes might be as bad. Thanks Surfer Girl - I’m done with the lurking now for sure. Charlotte does such a fantastic job of writing these blogs it’s been a great source since the beginning of Kate’s journey and now Meghan. And besides the odd heated debate (!) the comments made add a different perspective. Since the adoption of the pseudonyms now rather than the anonymous posting I’m getting to know you all a lot better, recognise your viewpoint and look forward to reading your comments - so thanks everyone. I’ve always been very proud and captivated by the royal family - and old enough to remember the excitement of the arrival of Diana. Now with Kate and William we seem to be steering into a new phase of modernity, whilst upholding the qualities of the Queen. The excitement and the potential that Meghan and Harry could possess will be so interesting to watch. I do think they have the potential for some great things that W&K may not (who will naturally take a more measured approach). Harry is wise enough to know his shelf life as one of the stars of the show is maybe limited until George, Charlotte and et all come into their own, as Anne, Edward and especially Andrew have moved slightly out of the spheres of influence later in life. I think Harry and Meghan together could have a wider appeal and longevity with their “Diana touch” though and remain firm favourites if they use this initial time wisely and build upon their success as a partnership. I think it’s wrong to compare them to W&K, but I do see a more exciting challenge for them to carve out, to create the sound bites and influence for a modern media world, and to inspire and use their position to champion causes like Diana did. Mr D, it is always exciting to read a comment by a long-term royal watcher! Long-term royal watching is almost sure to produce fascinating perspective as it surely brings broader context. Looking forward to more comments and observations from you! She's got such darling style. If you have ever looked at her blog "The Tig" (which I did after a post by you Charlotte!) it has the most darling things on it. Same with The Tig on Twitter. She is just darling. The thing I like about her is she wears her clothes effortlessly. Even with Claudia's non favorite ripped jeans, she wore the shirt and jeans like she just put them on and it was no big deal. And I agree, effortless is the perfect word to describe her fashion. She said in the "Tig" that Jessica Mulroney not only is one of her BFF's but also her stylist. For those of you who don't know, Jessica Mulroney is married to Ben Mulroney. Ben is a co host of a couple of Canadian television shows. Ben Mulroney is the son of Brian Mulroney, a former Prime Minister of Canada. Now Brian Mulroney was a political rival of Pierre Trudeau, also a former Prime Minister of Canada. Pierre of course, had a son Justin, who is the current Prime Minister of Canada. AND Justin's wife Sophie uses Jessica Mulroney as her stylist. We are all connected, aren't we? Kind of sounds like a mini British aristocracy. A very interwoven community. I am laughing because it sounds like the little city I love in. Very fun information Bonnie!!! Love the dress and it's colour . Good change to see her in dress than her jeans / shirt combo ! Charlotte u must do an engagement styling post ! I must admit it's interesting thinking about what she might wear once she becomes official. I agree bluhare, I think because Meghan is so into fashion, people will have fun choosing ensembles knowing she very well could wear them! Lovely post Charlotte! I think we'll see more and more candid pics now, I have to imagine the media attention around the set and her home has increased since the games, with everyone waiting for the announcement. I don't envy her for that, Claudia. I would hate feeling like I couldn't go outside without a herd following me. I hope she's got a huge upside (and I think she does) to put up with it. I think security has already finished that occurring with Meghan. Harry, remembering how the media took photos of Diana as she passed and then trying to sell the photos is probably a powerful, powerful motivation for him to not let the media even come close to overwhelming Meghan, ever. In past months it seemed that they had both pretty much fallen off the face of the earth as far as photos of them being available was concerned. I don't think they were home just eating bon bons and watching the telly all that time. lol They were no doubt out and about. But Harry having clout, and using it, managed to clothe them with their invisibility cloaks. :) My guess is, Harry is and will be more serious about privacy than even William. 💍Jessica Mulroney has taken her stylist interests to a new level. She has a internet presence now for wedding gowns and has even partnered with Randy Fenoli from "Say Yes To the Dress". This is according to Margaret Abrams, The Observer, "This is Why Meghan Markle Always Looks Perfect", 10/4/17. Eve. If they are friends of Harry's they'll be cool. Am sitting in a cosy hotelroom at the moment, my daughter (wise woman!) said I needed a break (from it all), so I booked a room for four days in the middle of nowhere, with healthy, fresh air and cows and fir trees for company - it´s absolutely lovely and so peaceful!! Thank goodness with some "modern comfort", so I can still chat with you lot!! Wise daughter for sure. Very sweet. P.S. Eve, after you have had a chance to wind down, perhaps you will consider my very humble, and hopefully not butinsky suggestion here on this page at 16:42. "Your mission, should you choose to accept it....", lol. Honestly, I am so sick of even TALKING about it....It only drives me crazy or directly into complete despair... both of which is NOT "my nature"!! "Harry is interested in taking up Diana’s mantle and pushing the monarchy in a direction it normally wouldn’t go,” says Arianne Chernock, a British history professor at Boston University. “He likes to have fun and be seen as of the people." You're speaking for me, Claudia! I agree. I think Harry and Meghan will have a bit more freedom to follow their passions and if Harry is even half as engaging as he was last week in Toronto the world will be his oyster. And if his wife feels the same way and is comfortable wearing a public persona, even better. I agree with all of you, they have a tremendous amount of potential. Only time will tell if they will live up to it. I'm preparing myself to be disappointed, but with Harry's charisms, sincerety, empathy and Meghan's wordlinessd intelligence and lack of timidity in selecting causes to champion I am hopeful they will be very impactful within their roles. You have all been so sweet and supportive, so I thought I give you these good news... Please keep fingers crossed that everything goes well... THANK YOU SO MUCH!! I'm glad to read that Eve and I will keep my fingers crossed that everything works out for you. The setting sounds lovely! I think Meghan's choice of decor and the tone and style and content of The Tig truly represents in many ways the mind of Meghan. I am so disappointed that she shut that blogsite down. Que lastima'. I love your Duchess Kate blog, Charlotte, and have been enjoying this new Meghan one too! Just noticed an edit on the dress brand from the Invictus Games opening ceremony (referenced in both this post and the original): it's Aritzia, not Artizia. Thanks for all the work you do and the wonderful content you produce! surfer girl, it amazes me the vast connections that Meghan has (the girl sure knows how to network!). I know she is part of the "Hollywood" set, being an actress & all, but it boggles the mind how many 'influential/political' people she knows. I hope she uses her social circle for the greater good when she marries Harry. I have a feeling that Meghan will be a force to be reckoned with when she officially joins the BRF...can't wait to find out how she will impact the world. Her UN speech seemed like the beginning of things to come ( I hope!). I know. Her network of friends is pretty amazing. How that happened? I have no clue, except her "Suits" fame definitely opened some doors it seems. But still, a lot of people have fame and not that caliber of network. And when she gets to KP I hope she isn't stifled. To me, Meghan must believe she can accomplish her life goals even within the parameters of the "Palace" or she wouldn't be continuing her involvement with Harry that is so very much pointing towards marriage. Certainly she and her friends have discussed her freedom within that system. Surely she and Harry have discussed it. Surely she and her very best BFF, her mom, has had influential input. Meghan may have to tailor her goals to fit the royal family but even so, that is quite a dynamic platform. I so hope that they wrap up filming of "Suits" early. We know that she reportedly already turned in her vehicle rental saying she was going to be in London. Like many others, I am becoming more sure that they are already engaged. They had a lot of things to plan so Meghan could move to London and decide about her career. This gives them a relatively calmer public do that in. Once they announce their engagement it will be a media blitz. Although I think Harry even then will still keep cameras away from he and Meghan in their private time just like he is doing now directly or indirectly. Those photos are in the article, "Meghan Markle's Squad of BFF's is Packed with Powerful and Strong Women", Popsugar, Marcia Moody, 10/11/17.